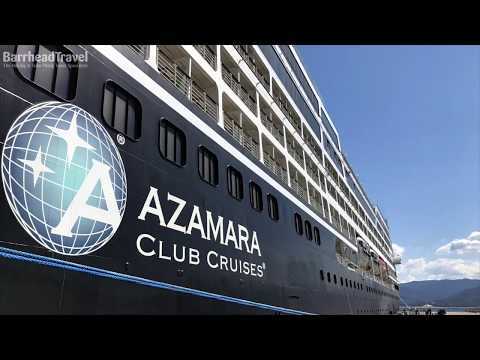 Barrhead Travel are delighted to bring you an amazing offer from Azamara Club Cruises. Sample renowned cuisine on an immersive tour of the Mediterranean or dive deep into the heart of Alaska’s indigenous culture with your favourite travel companion. No matter where you go or who you’re with, you’ll have the opportunity to make unique connections across the globe. Call our friendly cruise consultants today to find out more about the applicable cruises in this amazing offer. Azamara Journey® and Azamara Quest®, and the new Azamara PursuitSM, are three mid-sized ships that sail to the world’s most-loved destinations, enjoying the added benefits of visiting smaller ports not accessible to larger vessels - find out more and book today with Barrhead Travel! Our Azamara cruise deals are now more inclusive than ever before with selected beers, wines, spirits and gratuities all included in the cruise fare. Plus, Azamara Club Cruises are proud to introduce their complimentary Azamazing Evenings Events. Available on almost every voyage (except short cruises and Transatlantic crossings), these exclusive on-shore events will allow you to experience the best of the local culture in unforgettable settings. Tailored to the destinations you visit, each event will be different - it could be an evening at the ballet at the Mikhailovsky Theatre, a medieval feast at a French chateau, a sunset festival on a rooftop terrace in Dubrovnik. Barrhead Travel are a recommended travel agent of Azamara Cruises and provide the discerning traveller with a luxury experience, so if you are looking for indulgence as you explore tropical locations around the world – Azamara is the cruise line of choice. The onboard experience of Azamara cruises gives you a luxury professional service with its fine cuisine and top-class spa facilities.